Hiding in plain sight: what is reality? Everyday you wake up, open your eyes, and a world of shapes and colors come rushing in, everything in your room looks exactly the same as last time you’ve checked, or maybe your cat moved something around while you were sleeping, but your room still looks familiar. You go outside, not much has changed, your car is still the same, the tree in your front yard is still the same dark green cypress, the houses around didn’t change much from last night. The world, as you perceive it through your senses, doesn’t change much from day to day, allowing you to construct a consistent reality, based on your perceptions and beliefs, that you assume as true. An external world that you are confident that exists independently of you perceiving it, with the same qualities/properties that you attribute to it. The external reality you conceive is made of shapes and colors, scents and motions, textures and tastes and sensations. But have you ever stopped to question about if all of that you interact with, the inputs that you receive from the world around you, represents the ‘true’ reality? Or is it maybe an incomplete representation of reality? Let’s take a red apple in front of you, for example. You can grab it, look at its round shape, feel its smooth texture, examine its red color and grab a bite and taste its sweetness. It truly feels like an apple to you in every sense, but are you experiencing the ‘real’ apple itself? Or just some properties that you attribute to what you describe as an apple? If you ask someone else who sees and feels the apple, they surely will agree with you in the description. But as soon as you start to look in more detail, doubts can begin to arise. Color might change and different shades of red might appear depending on the light being reflected, or the absence of light will dramatically change the color to dark. For a color blind person the color, in the same conditions of light, will look different, for a dog as well, and there’s no reason to believe that the color you see is anymore real than the color another person or animal sees. The color is, therefore, not something which is inherent in the apple, but something that depends upon it and the observer and the way light reflects on it. The same can be applied to other senses, like texture. The apple looks and feels smooth and even on its surface, but through magnification, with a microscope let’s say, we can see roughness that is imperceptible to the naked eye. Bertrand Russel (1872-1970), a British philosopher, calls “sense-data” to the things that are immediately known in sensation, like colors, smells, hardness, etc. A ‘sense-datum’ is that of which we are aware, and the awareness itself is the ‘sensation’. Therefore, if you are to know anything about the apple, it must be by means of the sense-data associated with the apple, but the apple isn’t the sense-data. But what does the ‘real’ apple looks like? If my belief that I’m seeing the real properties of what I call a ‘red apple’ is wrong, what is there after all? Am I misinterpreting the nature of my perceptions? Let’s keep our attention focused on the sense of vision. About 1/3 of the brain’s cortex participates in the visual process. When we open our eyes, billions of neurons engage and the snapshot of the world taken at each moment by the eye is just the very initial part of that process. Most of it involves the creation of the shapes, colors and motions you see, the construction of literally everything you see. 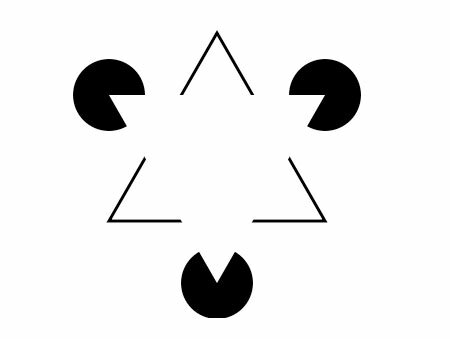 For example, visual illusions of movement or shapes that we love looking at just for fun (ex. illusions 1 and 2) are, in fact, an indication of that construction process. But neuroscientists go further and claim that we ‘reconstruct’ reality. That means that the process of vision reconstructs an accurate view of things that would exist even if there was nobody to see. It is accepted that seeing more accurately has an adaptive advantage, evolutionarily speaking, and, therefore, we are the descendants of those who saw more accurately. Vision is accurate and the idea is that accurate perceptions are fitter perceptions (fitness is defined, in evolutionary biology, as reproductive success and reflects how well an organism is adapted to its environment). But visual accuracy doesn’t necessarily mean that you are perceiving reality as it is. Evolution is driven by fitness, as described by mathematical equations that describe it, and not by reality. We have hardwired tricks and hacks that were ‘created’ during the evolutionary process to keep us alive. Evolution has shaped us with perceptual symbols: if you see a snake don’t get near it, if you hear a stream of water in the middle of the desert run to it, if you hear someone crying, go check it; that are designed to keep us safe as an individual and as a species. But that doesn’t give us any indication about if we’re seeing reality as it is. Now, you can say that you agree with all that, but we’ve already started to unveil the true reality. Physics tell us that the physical world is almost empty space, that all comes down to atomic particles bouncing around and interacting with each other. But Science describing the physical world is like someone looking at a computer desktop and exploring its interface, trying to understand the reality of the computer. And if you try to magnify and look in more detail at the pixel level, you still never left the user’s interface. We’re naturally inclined to think that perception is like a window on reality as it is, but the theory of evolution is telling us another completely different thing. ‘Our reality’ is more like a 3D desktop that is designed to hide the complexity of reality away and guide adaptive behavior. Space-time as you understand it is just your desktop. If we take any given object, as the red apple, of the sort that is supposed to be known by the senses, what the senses immediately give us is not the truth about the object as it is apart from us, but merely certain sense-data which depend upon the interaction between us and the object. What we see is just an incomplete representation of reality, that is hidden from us and that, perhaps, we still lack the cognitive and processing capacity to address and describe. There is something that continues to exist when there is nobody to see, but it is not space-time and physical objects. When you have the experience of interacting with what you describe as an apple, you’re interacting with reality, but reality itself is nothing like an apple. Likewise, and this is to kick things up, when you have the perception that you describe as a brain, you’re interacting with reality, but reality is nothing like a brain. And that reality, whatever it looks like, is the source of cause and effect in the world, something that underlies our perceptual experiences. This can have important implications on the mystery of consciousness. An interesting idea is that, maybe, reality is an interacting network of conscious entities that influence each others conscious experiences. Possibilities are still open and probably the next breakthrough in evolution will be the capacity to understand and describe consciousness and its underlying mechanisms, hopefully awarding us with new insights on the true nature of reality that lies beyond our limited perceptions. Edge. 2014 : WHAT SCIENTIFIC IDEA IS READY FOR RETIREMENT? True Perceptions are Fitter Perception, by Donald Hoffman. Finding the self: does science has something to say? When we start discussing about ideas still so dividing and controversial, we usually begin by wandering through philosophical realms before science is capable of providing us with stronger arguments. In neurosciences it is well understood that the brain is capable of creating illusions through a mechanism of ‘auto-filling’, which is useful during the process of making sense of the world around us with the information available at each moment. For example, let’s say you’re walking in the woods, at a given moment your brain perceives a snake dissimulated under the fallen leaves of a tree, adrenaline kicks in to make you aware of the danger and prepare yourself to ‘fight’ for your life. When you take a closer look, now with more information available because you focused all your conscious attention on that potential source of danger, you realize it is just an old rope and that there is no danger after all. At that first moment of reaction, your unconscious brain perceived a snake after sufficient information was available to increase the likelihood of it being a snake, and a primordial yet efficient defense mechanism was triggered, the “fight-or-flight” response. A series of inputs, like perceiving the woods as a propitious place for snakes, the sound of leaves being moved and an hidden object, somewhere in your field of vision, with a snake-like shape, triggered that response. The brain ‘filled in the gaps’ where information was missing, considering past experiences and genetic per-disposition, creating the illusion of a snake that wasn’t there after all. These illusions are created all the time in order to help us make sense of the world and be fit to ‘survive’ in it (I know we are not living in caves anymore but we bring a lot of baggage from those difficult times, evolutionarily speaking). However, the idea that the sensation of having a self is an illusion itself, created by the brain, has been difficult to address out of the philosophical discourse. The illusion of the self is a theory that aims to describe the sensation of “I”, a sense of individuality, separateness and self-centered perception of reality, as a creation of the mind and the only thing there is that is aware of that sensation is consciousness. While this idea has been explored for millennia within religious and spiritual circles, being Buddhism the most impactful one, Science only had the audacity (and the resources, of course) to take on the challenge during the middle of the 20th century. A unique opportunity for research on the subject presented itself when a series of patients that were submitted to a callosotomy (a medical procedure to cut the corpus callosum, the main neuronal tissue that connects both brain hemispheres at the neocortex level) in order to treat serious cases of epilepsy started to show some strange yet interesting behaviors. These people are known as the “split brain patients”, and their condition is where I want to focus during the rest of this post. One of those patients is known in scientific literature as Vicky. Sometime after the procedure, Vicky started to experience some troubling behaviors. For instance, she would find a visit to the supermarket a complete ordeal. Both her hands would not agree on what to pick up from the shelf – “I’d reach with my right hand for the thing I wanted but the left one would come in and they’d kinda fight”. Getting dressed was also a challenge for the same exact reason. Her brain was behaving in some ways as if it was two separate minds. Before fMRIs became mainstream, these patients have proved valuable to determine differences between the hemispheres, which the communication highway has been severed. For example, the left side is where speech and language are mainly processed and the right side specialized in visual-spatial processing and facial recognition. Another patient, WJ, was asked, during one of the experiments, to press a button whenever he saw an image. The researchers would flash words to his left or right field of view . Since the light inputs in the left eye are processed by the right hemisphere and vice-versa, images presented to one side delivers the information to the respective hemisphere while the other is ‘blind’ to the stimuli. WJ had no problem to tell the scientists what he saw when the stimuli was presented to the left hemisphere, or right eye. Yet, he would claim he didn’t see anything when the the image was shown to the right hemisphere, notwithstanding his left hand pressing the button every time a word appeared to the right eye. The left and right didn’t know what the other was doing. On a third experiment, a young patient was asked about who was his favorite girlfriend, with the word ‘girlfriend’ presented to the right hemisphere. He couldn’t answer verbally. His right-hemisphere has seen it, but the language processing left-hemisphere remained unaware. Then, using his left hand (which is controlled by the right-hemisphere, but I’m pretty sure you know that by now), the boy spelled LIZ with the letter tiles in front of him. There is no doubt that the right-hemisphere is experiencing the world but it cannot communicate verbally, only by controlling the left hand. Despite the impressive effects of splitting the brain through callosotomy, researchers have reported that the patients involved in the studies never expressed feeling anything less than whole, that is, they would still have a unified sense of self. The hemispheres didn’t miss each other in some sense. Further experiments were carried out where subjects were asked to explain with words actions directed and carried out by the right hemisphere. The left-hemisphere would make up a post-hoc answer to fit the situation. This observation has huge implications related with the ‘story-telling’ capacity of our brain. It is important to mention that in split-brain procedures the brain is never completely split. The sub-cortical region, a more primitive region of the brain, continues connected (or the person would become seriously impaired or even die). Patients that mastered a skill before the surgery would still be able to coordinate the hands for the task, for example a fisherman would still be able, with no apparent difficulties, to tie a fishing line (it is coordinated by deeper sub-cortical levels of motor control), but when introduced to less familiar tasks, he would have a hard time to complete them. There are other clinical cases where the self seems to malfunction spectacularly. In Cotard Syndrome, for instance, the victims believe they do not exist, even though they admit having a life history, or in ‘Dissociative Identity Disorder”, the person seems to harbor multiple selves, each with its own name, memory and voice. There is still a long way to go until science is capable to clearly describe the self, determine where it is ‘created’ in the brain, how it can survive radical surgical procedures like in split patients, how it can change completely in some cases and how this not-so-apparent illusion shapes our very perception of reality and influence the consciousness in creating the narrative of our life. Consciousness is, without a doubt, a mysterious entity and I believe that the self is itself something that exists as long as there is consciousness to be aware of it, it cannot exist independently of a brain, and it is therefore not real, an illusion. But like our thoughts, sensations, emotions, it is a product of the chemistry of the brain and there is only consciousness at the end to be aware of all of that. The stream of consciousness is all there is, and even if you suffered a serious amnesia or your psychology was replaced by Donald Trump’s, you would still have consciousness. But would you still be You? Sam Harris. 2012. The Illusion of the Self: An Interview with Bruce Hood. Salt-loving plants: saviours of planet Earth?